Are the stars out tonight? You bet! Our new LED Lighted Stars are always out and ready to brighten your day and night! 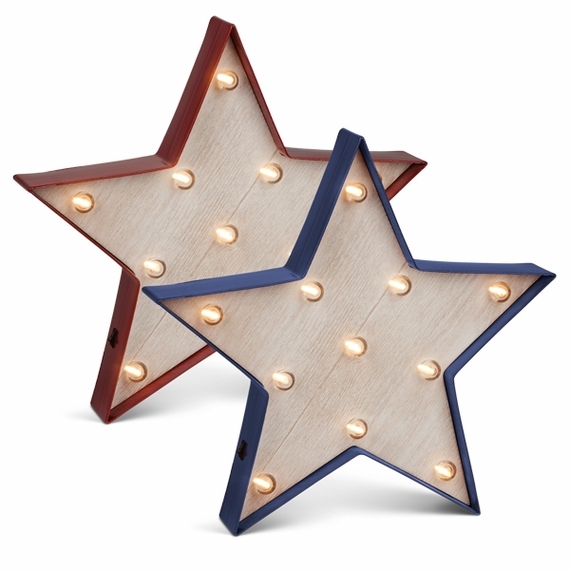 You get 1 red and 1 blue lighted star and these popular accent pieces can be used in so many settings! Each star is 13.5" tall, 13.5" wide and is 2" deep with 11 warm white bulbs. These LED bulbs are bright but stay cool to the touch and will last for many, many hours. The housing is hard plastic in matte red or matte blue with a bleached wood look background. There is a keyhole cutout on the back for ease of hanging but of course these also look fabulous sitting on a desk, table or shelf and since each star only weighs just under 1 lb., you could suspend them from the ceiling, a tree or string them on a rope or line (these are not weatherproof). 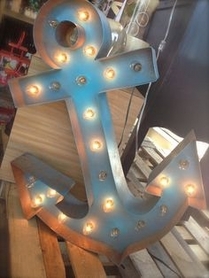 You can even use a magnet hook to hang them from any metal surface. Stars never go out of style so these jewels of the sky can enhance your everyday Decor and since they're so portable, use them to light up your holiday parties, festivals, celebrations, picnics and events. Each star has an easy access on/off switch located on the side of the sign. Each star weighs just under 1 lb. and each requires 2 AA batteries (not included).